Probably my favorite part of the convention was going to the live drawing of a Penny Arcade comic. I liked seeing how Gabe and I have a few drawing quirks in common, most noticably the fact we have to draw the outline of an eye perfectly in one stroke, and if something we drew isn't what we wanted, we undo that last line into oblivion, even if it takes a dozen tries. I can only hope to achieve just a sliver of what Tycho and Gabe have accomplished. Anywho, on with the comic. Whenever I get a little feedback from my audience, it's often that they want more Altaïr, and who can blame them, he's awesome, if he wasn't awesome I wouldn't have put him in the comic to begin with. But at the end of the day, the simple truth is he isn't my character and I shouldn't rely on him as much as I have. 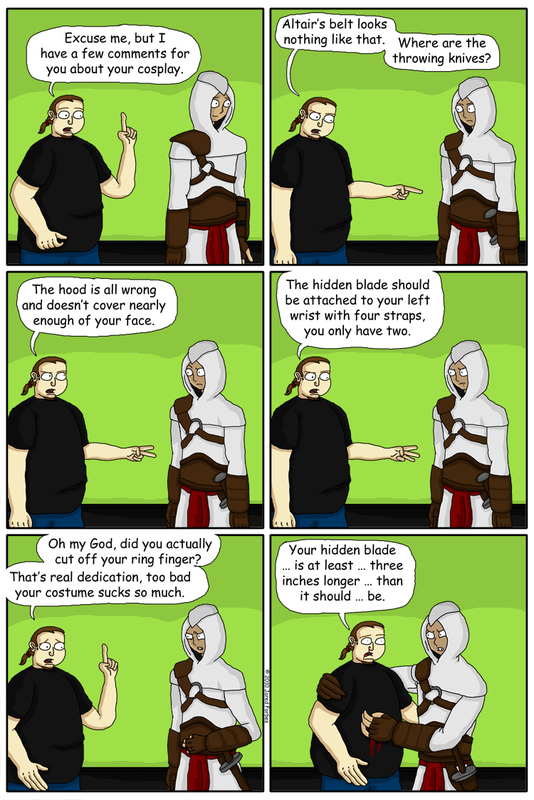 That being said, this'll be the last Altair comic for a while. Oh yeah, and my biggest fan, my Mom. Even her favorite character is Altaïr. Don't really know what to make of that.